It seems like in every gameplay video i've seen by someone who isn't a coaster enthusiast, they mistake the drive tyres for launch tires, thinking putting them in will make the coaster speed up and using them as boosters, only to be dissapointed when it doesn't. Might be a good idea to rename them "Transport tires" or something to make it clearer that they're just for moving a coaster along the track rather than speeding it up. except that drive tyres are actually used for acceleration on some coasters, and an acceleration option is in the game for them, it just doesnt work at all. as a coaster enthusiast myself, drive tires (or friction wheels) are a very diverse mechanism in roller coasters, they are NOT just used for stations and are also used for acceleration and launching. they are indeed, as like real life, meant in the game for acceleration, (among other things) and do not work as they are bugged, as posted in the bug section a few times now. How are they bugged? As far as I can tell they are intended to be slow in the coaster types we currently have. The acceleration option sets the acceleration rate just fine - to accelerate the train to the target speed that you have set. The team seem to be sticking with absolute realism in terms of coaster types so I would imagine if they want to put in a coaster which has launcher wheels, then that will be coming, but the ones we have at the moment only have slow drive tyres. yeah but they are one in the same, the same exact mechanism is used for both purposes, friction wheels are never really used for stationary launching but to slightly accelerate a moving coaster or combat the slow down from friction, they are also used to roll a car into a station or lift hills or slow speeds, if they are going for realism, they would work for both purposes, which they dont, and the acceleration, does not work at all, ive done tests in game to check this, (as others have as well) the coaster goes the same speed regardless of acceleration set. yeah but they are one in the same, the same exact mechanism is used for both purposes, friction wheels are never really used for stationary launching but to slightly accelerate a moving coaster or combat the slow down from friction, they are also used to roll a car into a station or lift hills or slow speeds, if they are going for realism, they would work for both purposes. EDIT: The acceleration effect is minimal since they only accelerate to the target speed and not beyond it, but I have noticed a difference when I've been using them. well i havent at all, ive done tests with the coasters on a flat track, it does not accelerate at all. it reaches the same point, at the same time, regardless of length, whether you use accelerate or not. They will only accelerate if they are going slower than the target speed beforehand though. If your train is already travelling at 4m/s, and your target speed is 4m/s then there is no need to accelerate, the speed is just kept constant. That is what happens most of the time unless you get your train to slow down to the point of almost-stopping first - then you will notice the acceleration. after testing that, you are correct, i guess the acceleration of 2m/s was confusing me as i wasnt thinking the target speed was a limit. regardless though, friction drive tires are indeed still used to accelerate a fast moving coaster, and should probably have the option to do so. It's okay, I can see how it can be confusing. And to add to what the OP said, I like them being called Drive Tyres but I think if we get coasters in the future that have launching capabilities then they need to make sure the names are distinguished from one-another. I disagree, I expect drive tyres to be only powerful enough to move it along a relatively flat track. For a hill, I would assume the chain lift would be used. 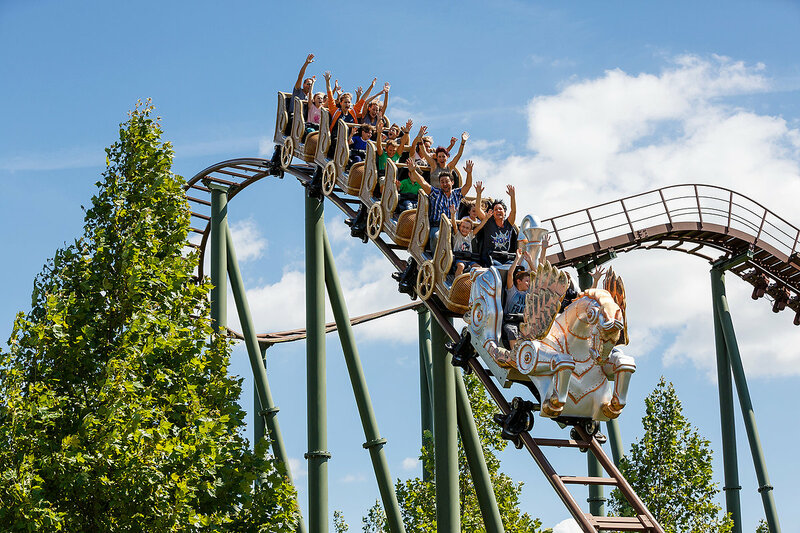 I disagree to you Brownish Monster,here's a picture.As you can see in the background(i have no better picture),this coaster(the park is near my home)uses friction wheels as a lift hill. Really? Looks pretty small to me. It's one of those ones that you feel like you are going to fall out of at every turn [big grin]. And if that is the case then there is no coaster of that type in the game (yet! ), and none of the other types that are there have lift-tyre functionality in real life. thats the whole point some of us are trying to make though, if they are truly going for realism, regardless of use, its all one in the same. its not about this coaster has it so its only used that way, friction wheels are a versatile feature for coasters and are not different from coaster to coaster, only in how its used, but the mechanism itself is the same thing used for many different situations, on different coasters. if you wanna get real technical, drive tires, how they are used in planet coaster, for only rolling trains on straight track are actually usually facing up, not perpendicular. (which, by the way is missing from the stations...hopefully this isnt forgotten) depending on the coasters design itself. when used for acceleration and lift hills, thats when they are facing perpendicular to the track, and the trains design takes advantage of this....its because dual tires facing perpendicular to the track as opposed to facing up provides more grip for acceleration or lifting, the extra grip isnt really required for level track, so less tires are used and facing vertical, again, depending on the car/track design itself. the reason for all this is purpose and cost, perpendicular systems are more expensive and the extra grip isnt really needed for level track. perpendicular wheels are sometimes used though for level track, sometimes. depending on weight and track design. my opinion, if they are going for realism, is they should provide 2 versions, perpendicular being used for acceleration, lifting and even rolling. and drive tires, that they have now, facing vertical and only being used for driving on a level track.